Each link leads to a Web site with a map showing the ride's route, with the pickup and destination tagged with markers. A card on the page also shows the first name of the rider and driver, along with the driver's photo, make and model of car, and license plate number. By combining the information displayed on the map with data gleaned from the source code, people could learn an awful lot about these riders and drivers through other Google searches. 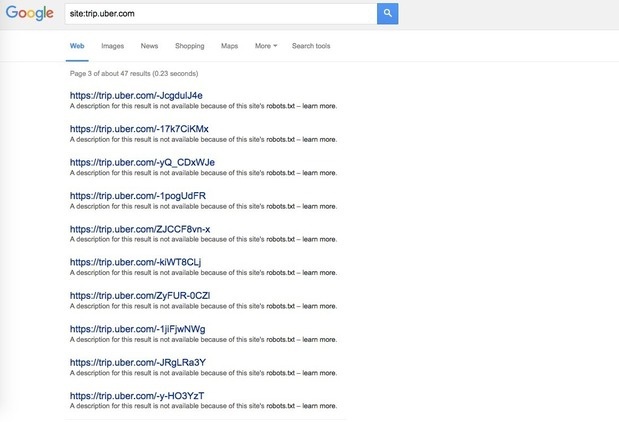 John Flynn, Uber's chief information security officer, in response, said the links were shared deliberately by users.